Receive faxes anywhere in the world - get a free 086 fax number today. How to invoice usHow does free fax to email work? We currently have no international options. 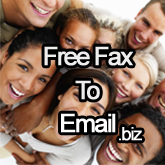 Fax2email is available for South Africa. You may use any email client to receive your faxes, and you can receive your faxes from facebook, yahoo, gmail or hotmail, you can receive your emails anywhere in the world. Rushing between departments, checking on the receptionist, asking a colleague to "keep an eye out for a fax" is now a thing of the past. Receiving faxes in your email box is not only faster, it is safer and less troublesome for your entire business. Sending multiple prints of a fax to your business colleagues or to your boss is now a thing of the past. Simply click the forward button in your email. Now your doctor can fax you that medical document, and the bank can fax you the urgent personal document, without announcing it the entire office about it. Convenience has never been easier.